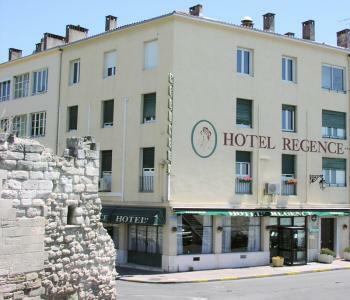 An inn in the center of Arles. Regence hotel is located in a modern building. The common areas are located on the main floor and the rooms are located on the two upper floors.Perfectly maintained, simply yet tastefully decorated, international visitors will find all of the confort they would expect. An important advantage for this hotel situated in the downtown area : The Regence hotel is surrounded by several parking spots where you can safety and confortably park your vehicle. As the hotel does not have a lift, we regret that we cannot accommodate people with reduced mobility.